Glass Greenhouse - Who Has The Best? 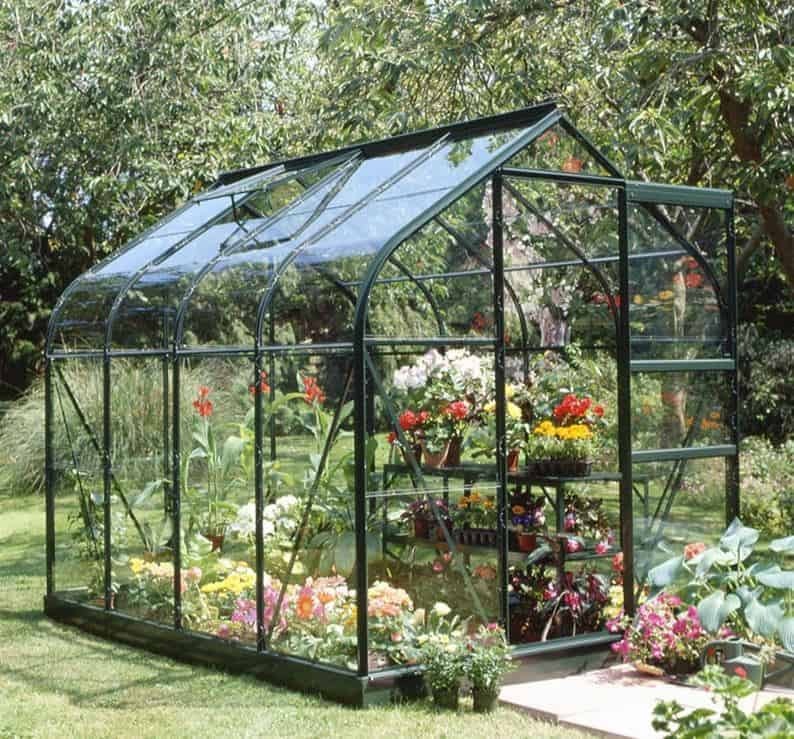 Using a glass greenhouse can help you grow beautiful plants and outstanding fruit and vegetables all year round. It’s a traditional method that in recent years has been challenged by plastic greenhouses, but to many gardeners across the United Kingdom it’s still the best. After all, a classic glass greenhouse with 3mm horticultural glazing offers better insulation and better light transmission than a greenhouse featuring single layer polycarbonate glazing. There’s a wide range of glasshouses to choose from, however, which is why WhatShed have created this handy guide to help you find the best glass greenhouse that can be bought online in the UK today, along with 19 high quality runners up. When compiling this league table we had to answer one main question: just what makes a great glass greenhouse? Price and value for money are obvious considerations, although we’ve been careful to include greenhouses to suit all budgets. We also looked at build quality, storage capacity, and their overall aesthetic appeal. It should also be noted that we have only considered greenhouses where glass is the main component, as if you’re looking for a superior quality wooden greenhouse we have a separate league table dedicated specifically to that category. Well done to the Eden Acorn glass greenhouse which takes the very top position in our WhatShed league table of the 20 best glass greenhouses that can be bought online in the UK right now. 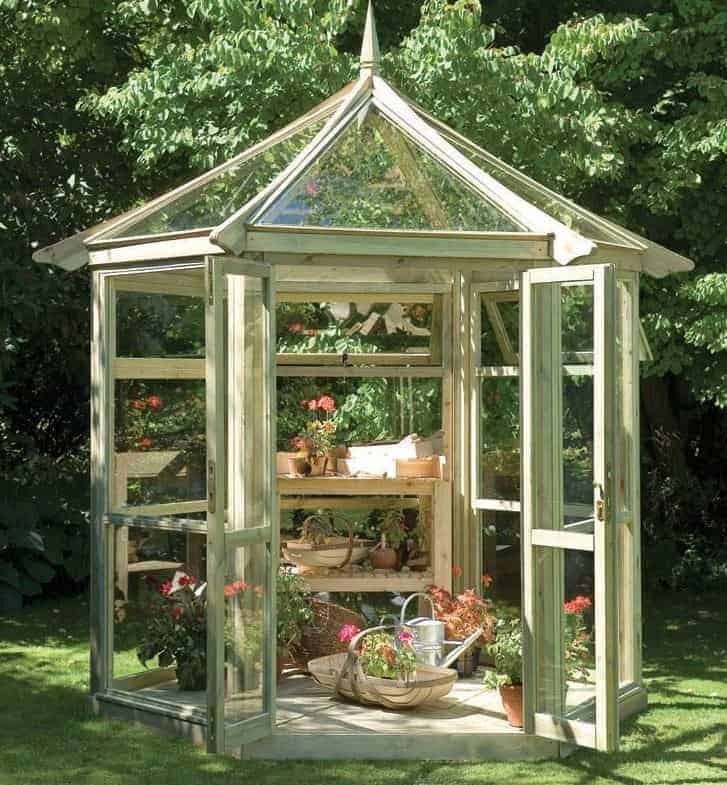 Its long warranty period and great value asking price make it a worthy winner, but every glass greenhouse featured within our guide can bring real benefits to a keen or novice gardener. At WhatShed we review everything from glass and plastic greenhouses, to timber garages, and our independent reviews can help you make an ideal purchasing decision every time. With so many examples to choose from, in a very diverse range of sizes and prices, selecting the ultimate WhatShed glass greenhouse was never going to be an easy task. 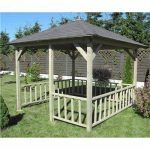 The Eden Acorn greenhouse takes this accolade however by combining classic good looks, excellent functionality, and great value for money. This may be very much mid sized in terms of the greenhouses that have made it into our top 20 league table, and yet it’s also very much one of the cheaper models, and we like the way that this makes a high quality glass greenhouse available to even more people. It has a base size of 1.93 x 2.51m, and with a ridge height of 2.14m there’s more than enough room to stand up comfortably once inside, although you will have to duck down a little when entering through the single hinged door. 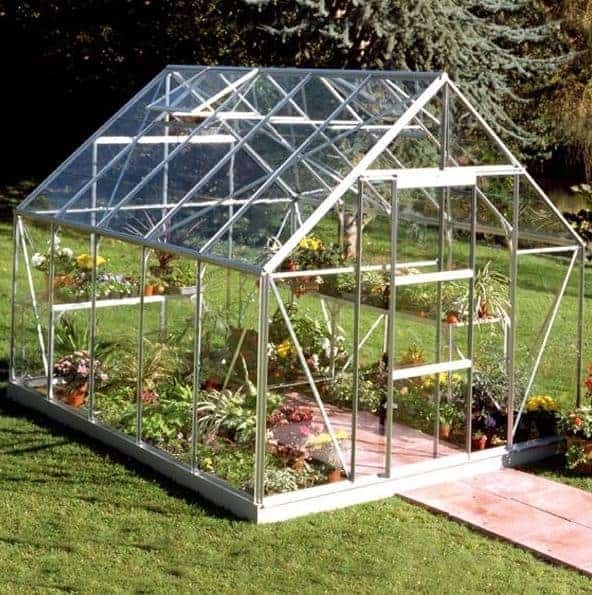 There are two extra features that we especially liked: it features side bracing to give it extra strength, which is something we wouldn’t normally expect to see in a glass greenhouse that’s as affordable as this. We were also glad to see that it comes with a long 12 year warranty, giving added peace of mind as well as the added value that sweeps this to the very top of our greenhouse league table. 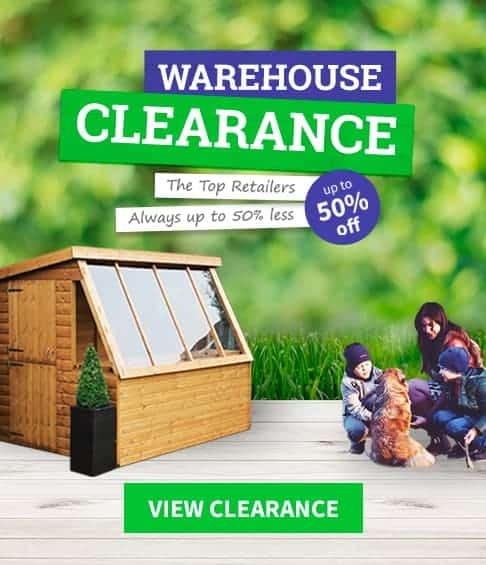 This is one of the largest glasshouses in our WhatShed league table, and this very generous size makes it ideal for keen amateurs or even professional gardeners looking to get the best out of their plants all year round. What we liked even more was the price tag that’s attached to it, as we were surprised to see that such a large and well constructed glass greenhouse could be available for less than a thousand pounds. With a range of additional features designed to make the life of the owner easier as well, this is a very deserving runner up. The first thing that struck us was the sheer size of this glass greenhouse, boasting as it does a base size of 2.57 x 4.45m, and with a tall ridge height of 2.46m. Entrance is provided by double sliding doors, and there are four integrated roof vents meaning that wherever your plants are positioned they can benefit from a regular circulation of fresh air on hot days. We were also pleased to see a guttering system included as standard, as well as the extra bracing that makes this feel so strong and reliable. 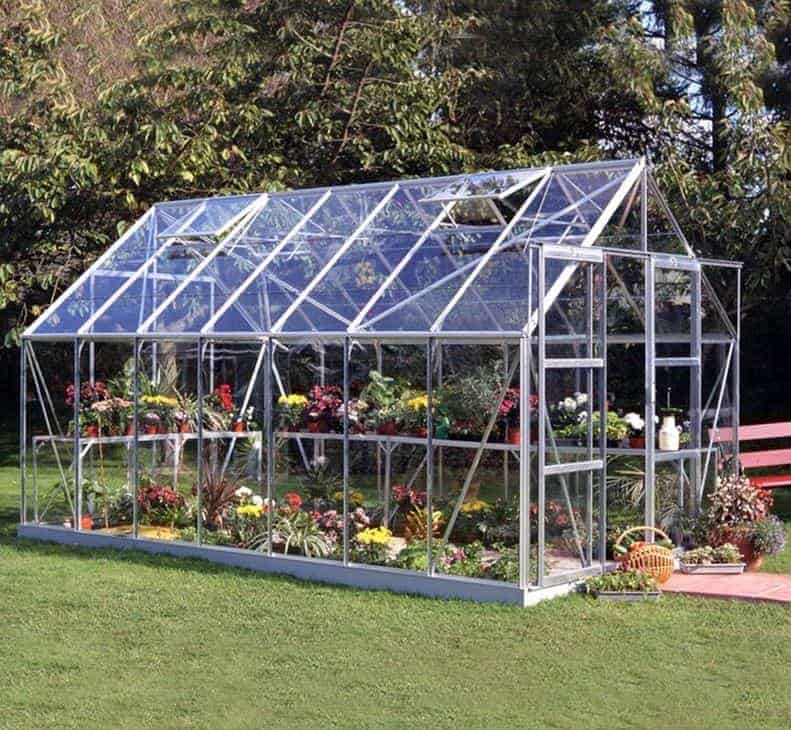 With a 10 year warranty for the frame and base provided as well, we feel this is a perfect buy for somebody in search of a large glass greenhouse. There can be few garden buildings that are both as functional and as attractive as an orangery, and this is in our opinion the most attractive glass greenhouse that we’ve seen. With a width of 3.11m and a depth of 3.16m, there’s lots of room inside not only for growing plants, but also simply to sit and enjoy a cup of coffee or a glass of wine. The inclusion of four roof vents means that you won’t overheat even on a summer day, and of course this is ideal if you’re growing oranges or tomatoes inside, or indeed plants of any variety. Thanks to its classic orangery design, which is a look that will add a stylish tough to any garden, it stood out at first sight, but a second look revealed many other features we found impressive. We were very glad to see that toughened glass had been used, so you won’t have to worry about panels shattering upon accidental impact or have to go to the expense of buying replacements. 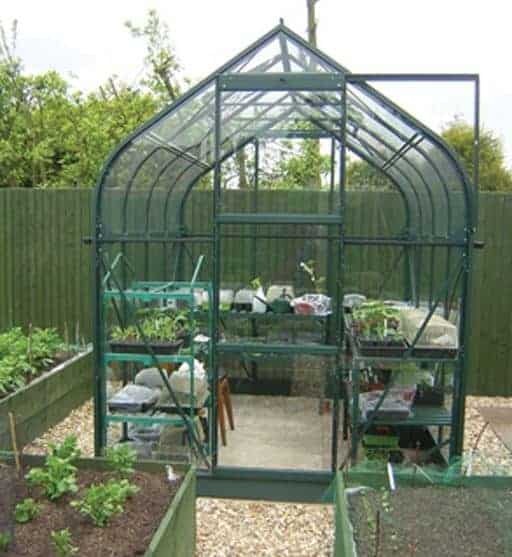 There’s also a 12 year warranty provided by the manufacturer of this glass greenhouse covering both workmanship and material, and with a strong aluminium frame used as well this should prove to be a very durable addition to your garden. With a base size of just 1.95 x 1.93m this is one of the more compact glass greenhouses to make it into our top 20 league table, and yet this in itself can be an advantage to some consumers. Thanks to this impressive building, even those with smaller gardens or whose space is at a premium can now grow more efficiently and for longer than ever before. The reason that this particular glass greenhouse makes it into the upper echelons however, is that it’s also very tough and reliable, and this is backed up by a 10 year manufacturer’s guarantee. The glazing was the stand out feature for us, as toughened safety glass has been used. This is even more effective than standard horticultural glass when it comes to insulation, and of course it’s a lot more shatter resistant which is ideal for those who will have small children or pets running around there glass greenhouse. It also features a clip in assembly system, which means that it’s very quick and easy to install. 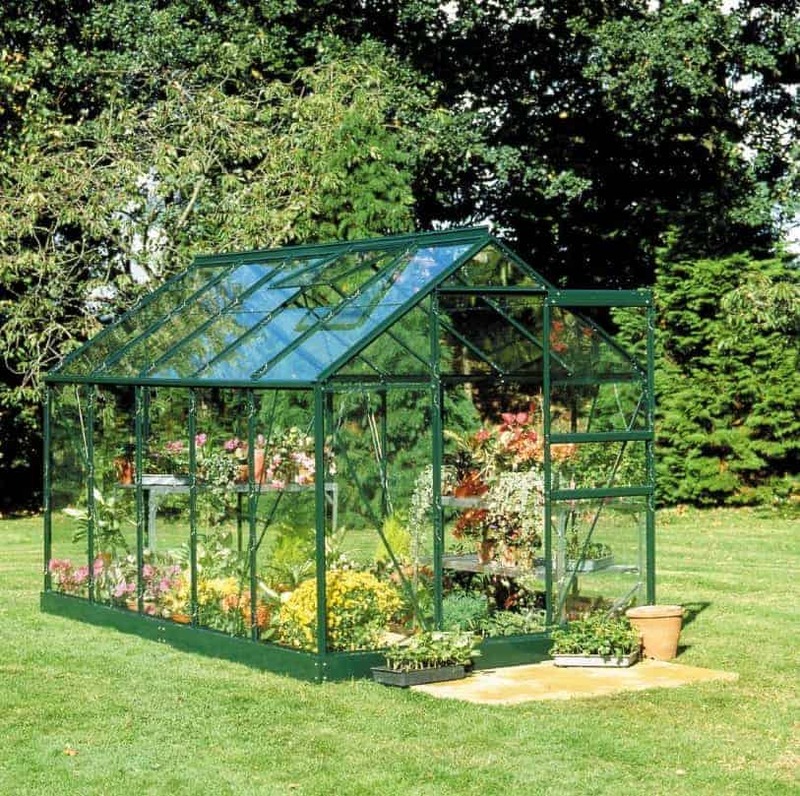 With a green coloured aluminium frame adding to its good looks as well, we feel this is a great choice for those looking for a glass greenhouse that will enhance their small to medium sized garden. We’ve reviewed lots of Halls greenhouses, and it’s a name that’s rightly respected by the public. This apex roofed glass greenhouse is a great example of what they do, and we also feel that it offers very good value for money for a glasshouse with a width of 2.57m and a depth of 3.22. It features aliminium framing in its natural silver colour rather than the green that we often see, but this gives it a very contemporary look that we feel will fit in well with buildings and gardens that have a lot of white PVC on show. One of the features that made this glass greenhouse stand out for us was the use of reinforced steel for the roof section, which should prove very reassuring in times of snow and storms. The roof also contains two windows that can be opened for ventilation systems, and we were pleased to see a guttering system running around it to collect rainwater that can then be used as a very environmentally friendly way to water the plants growing within. 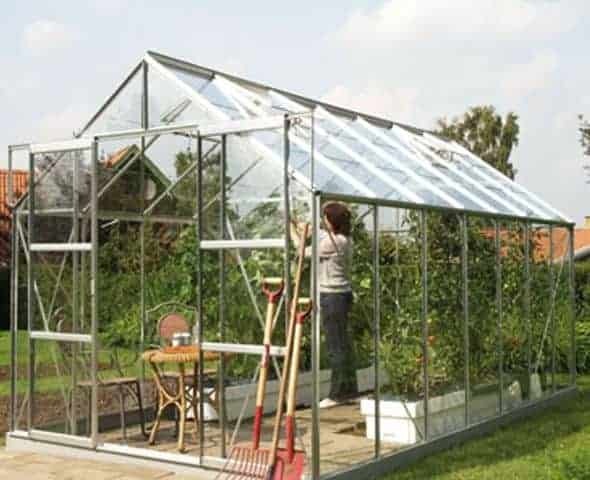 A 10 year warranty is provided by the manufacturer that covers both the frame and the base, and so this can be a greenhouse that lasts and lasts. Vitavia produce greenhouses in many different styles and sizes, and yet as we again found here they are invariable strong, well built, and good looking. This, like the vast majority of glass greenhouses we see, has an apex roof and yet it’s one that has a look all of its own. The eaves are beautifully curved, and as they rise to a maximum height of 1.98m there’s also lots of room to move around in. The green aluminium frame adds to the good looks of this glass greenhouse too, and as it has been powder coated there’s no need to worry about the colour fading or becoming damaged over the years. This frame is covered by a 10 year warranty, as is the base, so with extra bracing used on the sides this could be an excellent choice for people who want the benefits that a glass greenhouse can bring but who are worried about having to position it in an exposed or windy area. There’s a single sliding door, as well as an opening roof vent, and we were pleased to find that the door could be positioned on either side so that it fits in with almost any garden. It’s just one of the extra little touches that make this such a high quality glass greenhouse. This is the second of the eight foot by fourteen foot greenhouses to make it into the top half of our league table, and with the use of toughened safety glass rather than horticultural glass on this occasion this is an even stronger and tougher glass greenhouse than the one occupying the number two spot in our list. 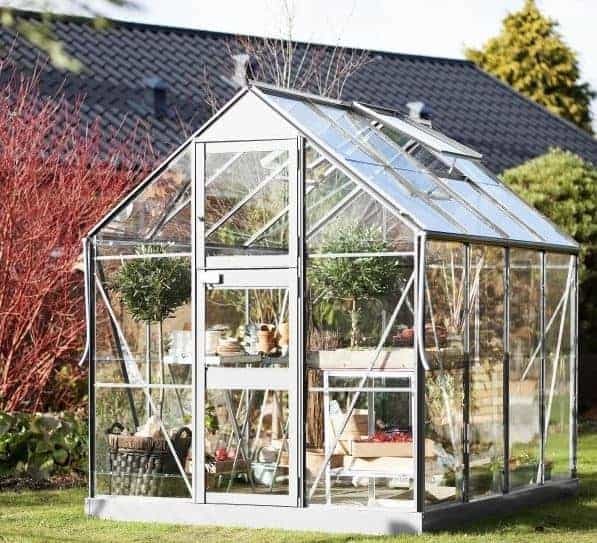 It’s only the significantly higher price tag that stops this model from being placed at the very summit, so if you need a large greenhouse and don’t mind paying around one and a half thousand pounds for it then you may want to consider this glasshouse before all the others. It’s only once you step inside through the wide opening double sliding doors that you appreciate just how spacious this glass greenhouse is. We were also quick to find how refreshingly airy it is, thanks to the inclusion of four integrated vents in the roof. The eaves of the roof have an attractive curve to them, meaning that this is a large greenhouse that you’ll be proud to have in your garden. With a 12 year warranty covering the green coloured frame as well, it should stay looking just as good as the day it was installed even after a decade or more has passed. This is the first glass greenhouse in our WhatShed league table to feature timber rather than metal framing, and whilst we have a separate league table specifically for timber greenhouses, this one was considered for this list because of the dominance of glass as a substrate. 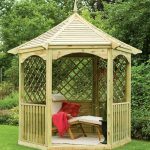 Nevertheless, the use of high quality planed European softwood makes this a very good looking greenhouse, and with a range of other value adding features included as well this deserves to take its place in the top half of our run down. We were very pleased to see that the timber used had been pressure treated, as this not only means that it’s very weather resistant it also means that the customer won’t have to spend time every year adding their own supply of wood preserver. This is also the basis of a 15 year manufacturer’s warranty, which is as long as any that we’ve seen provided on a glass greenhouse. One other feature we liked was the kerbless access through the lockable single hinged door, meaning that there are no difficulties in using a wheelbarrow to move plants, soil or objects in and out. With a tall apex roof reaching up to 2.44m as well, to complement a base area of 1.83 x 2.69m, this is a greenhouse that you’ll enjoy spending time in almost as much as the plants. This is the smallest Vitavia glass greennhouse to feature in our top 20 list, but it also has a unique and very attractive appearance, and offers excellent value for money, which is why it gains a position in the top half. 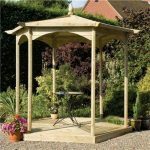 It has a hexagonal design that in effect makes it look like a glass gazebo or summer house, and so we can imagine this becoming a much loved and talked about garden feature as well as being an ideal environment to grow plants in all year round. The anodised silver finish on the framing is also very eye catching, particularly when the sun shines on it, and being made of aluminium its’ very tough and weather resistant. This is shown by the provision of a 10 year warranty as standard. We were also impressed at just how tall this glass greenhouse is, with the roof reaching a peak height of 2.57 with a very accommodating eaves height of 1.82. 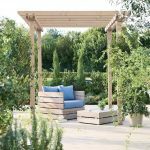 Even though this six sided design impacts upon the base area available because of the corners that have been cut away, it still provides a total growing area of 4.5 square metres, which we feel is more than reasonable at a price of less than six hundred pounds. Halls are a big name in greenhouse manufacturing, and they have a well deserved reputation for providing high quality at a very affordable price. 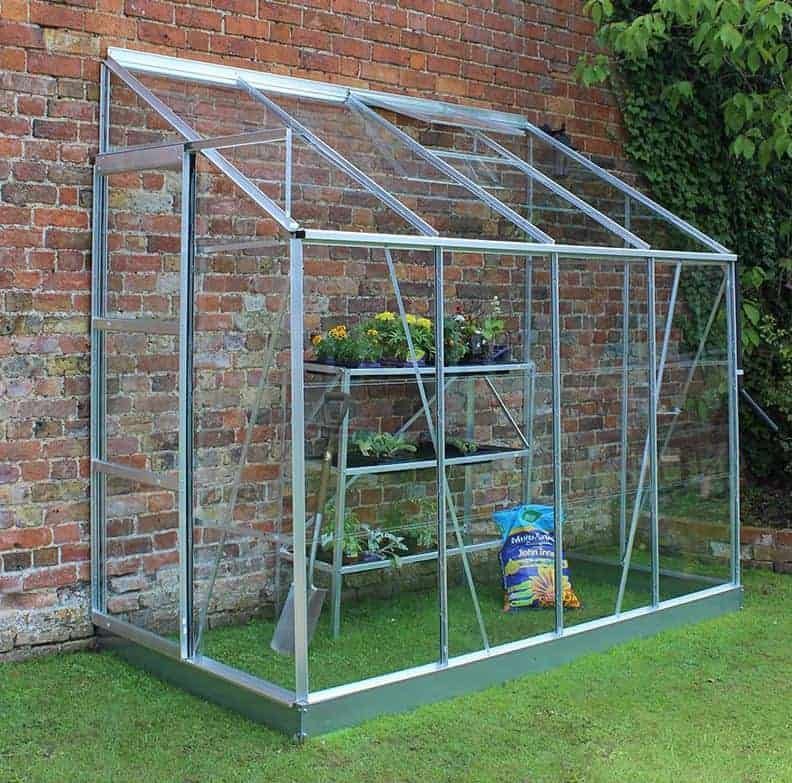 That’s certainly what we found on this occasion, and although this isn’t one of the larger glass greenhouses available to buy online in the UK today, with base dimensions of 1.94 x 1.92m, it is one of the cheapest that we’ve reviewed of a similar size. This great value for money is the reason this glass greenhouse takes the final place in the top 20 of our league table, but that wasn’t all that we found impressive about it. There are integrated gutters running along the roof’s framing, a feature that we don’t always see on much more expensive examples of a glass greenhouse, and this will be particularly welcomed by greener gardeners. We also liked the range of optional extras that can be added to the building at the time of purchase. One of these is an automated louvre vent, even though we were glad to see an opening vent in the roof included as standard. If you want a high quality greenhouse made by a company with an excellent name, but are operating on a tight budget, then this is certainly worthy of your consideration. This is the highest placed glass greenhouse in our list to incorporate a lean to design. This means that this is a less versatile building than a traditional apex roofed greenhouse in that it’s not really an area that you can sit down in and relax while reading a newspaper. For people who are serious about getting the most out of their greenhouse for their plants, however, this has a lot to recommend it. The lean to design means that the building can be protected from strong winds and heavy rain, and it also means that the structure as a whole is very strong and stable. Entrance to this glass greenhouse is via a smooth sliding door, and once inside the area of 2.55 x 1.29m means that you can grow a lot of plants, particularly if shelving units are introduced. There’s one centrally positioned vent as well, making it possible to create ideal growing conditions for your plants all year round. As this is also the cheapest greenhouse in our leaue table, it’s a great beginners greenhouse even though we would have preferred it to have included an extended warranty from the manufacturer on top of the statutory one year warranty that’s provided on this occasion. This is the largest glass greenhouse to make our WhatShed guide to the 20 best glass greenhouses available to buy online in the UK today. It has a base width of 4.45m and a base depth of 2.57m, as well as a ridge height of 2.39m at the summit of the apex roof. As such, it also represents outstanding value for money, as it costs less than eight hundred and fifty pounds, and so it’s only the lack of any extended warranty beyond the initial one year that prevents this from gaining a position much higher up our league table as it could otherwise have done. A green coloured version is available for an extra outlay, but we feel that this natural silver finish suits such a large glass greenhouse. The double sliding doors open to a width of 1.20m, so there’s lots of room to carry wide or bulky objects, such as bags of soil and compost, in and out. There’s also lots of ventilation, thanks to the inclusion of four opening vents in the roof. What especially impressed us, however, was the use of thicker and stronger aluminium framing, as we feel stability is especially important in larger glass greenhouses such as this one. This is possibly the most eye catching lean to glass greenhouse that we’ve seen, thanks both to its generous dimensions of 3.21 x 1.95m, and its curved eaves that give it a classic appeal. 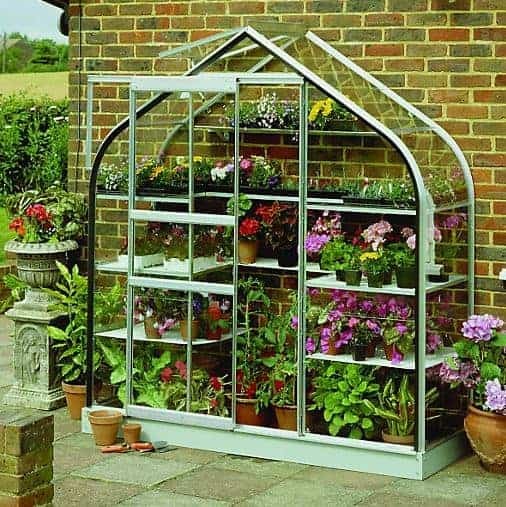 This is a very unusual feature in lean to greenhouses, and yet we know it’s one that many gardeners will appreciate as it adds to the beauty of a property rather than detracting from it. 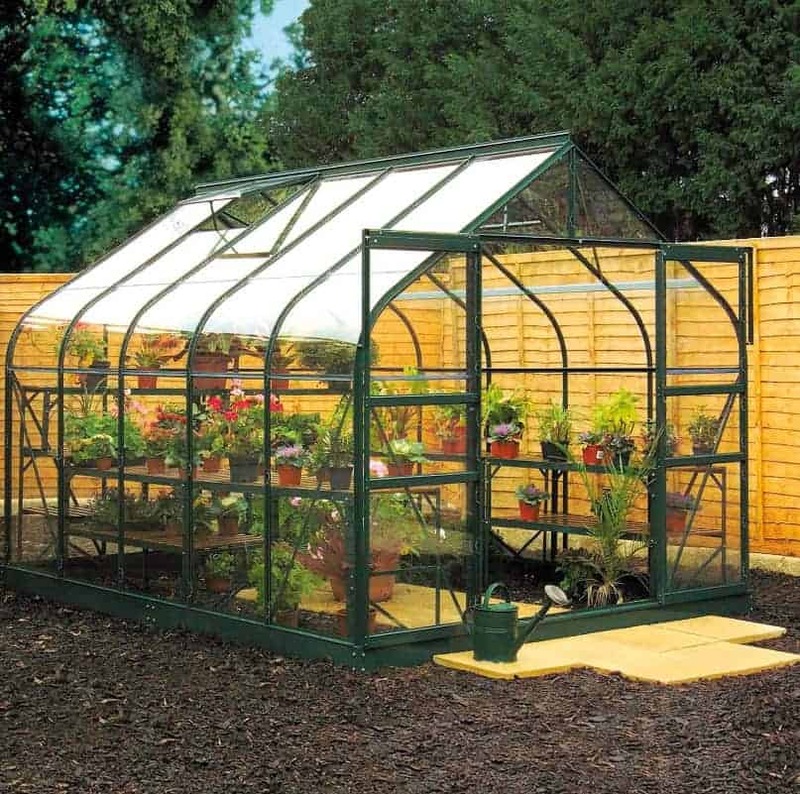 For such a well designed and well sized greenhouse we feel that it’s very reasonably priced too, and once again it’s only the lack of a long warranty period that prevents this from achieving a much higher position. Thanks to its generous size, this is one lean to that you won’t mind spending time inside, and there’s over seven and a half foot of headroom available at the tallest side that’s designed to be attached to a wall. 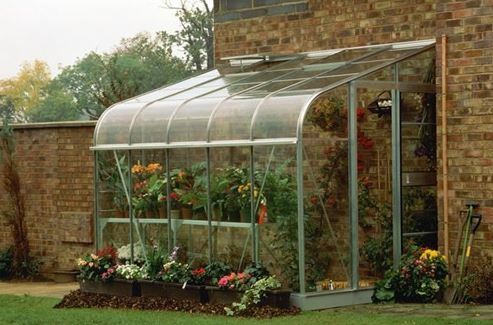 Being a lean to it’s also very strong of course, making this glass greenhouse an ideal choice for people who are wanting a sheltered area in which to grow their plants that has added protection against the elements. There are two vents included as standard, and we also liked the options that are available to upgrade to toughened glass and a green rather than silver frame. 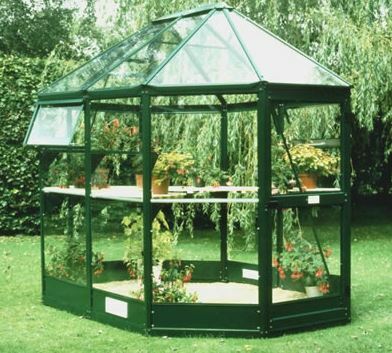 This is another model from the Halls Popular range, and although this glass greenhouse is slightly roomier than its stablemate it’s also significantly more expensive and this accounts for its lower final positioning within our league table. This is not to say that the building is expensive, however. With an asking price of under four hundred pounds we feel that this would make a good value addition to a medium sized garden. Once again, horticultural glazing is used, and we always appreciate the excellent insulation properties that it provides for plants. In fact it comes with an R rating of 0.93, as opposed to the 0.83 rating associated with single layer polycarbonate greenhouses. This makes it ideal for plants that would otherwise be sensitive to low temperatures, and with a base area of 2.57 x 1.93m there’s plenty of room for them. It also has to be said that this is a very attractive glass greenhouse, and we especially liked the racing green colour scheme that has been applied to the resilient aluminium frame. With gutters and an opening roof vent included as standard, this could make a perfect step up for those who have only had a miniature or lean to greenhouse previously. 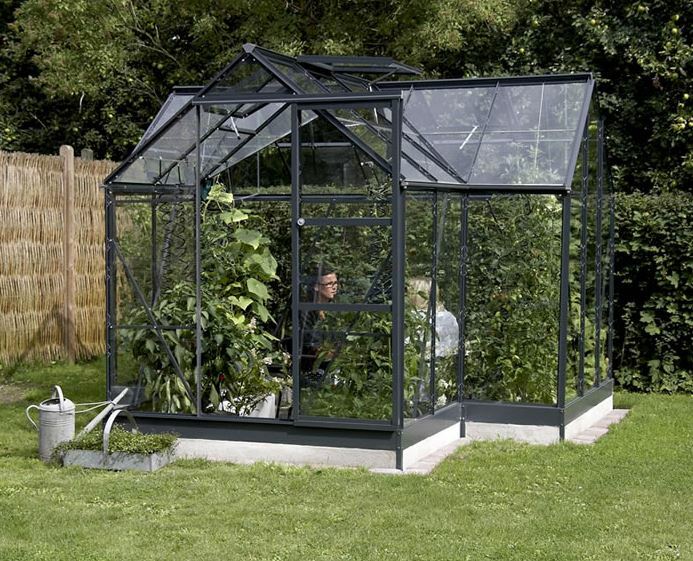 At first glance this glass greenhouse looks like many others, with a rectangular base, sliding door and apex roof. It’s only when we got a little closer that we realised that this particular greenhouse has a unique design feature: sloping sides. This is very pleasing on the eye, particularly when combined with the green colouration added to the aluminium frame used here, but it also plays an important functional role as sloping sides help more light reach the plants and they also provide even better insulation on cold days. This is the reason that this beautifully constructed greenhouse gains its place in our list, despite a relatively high price tag and only a one year warranty period. We are used to seeing a glass greenhouse of this size, 8’8 x 7’1, have only one vent, positioned in the roof, so we were pleased to see that in addition to that vent this also has a base vent that allows for greater circulation of air. There are also aluminium gutters and a downpipe as standard, and so if this falls within your budget for a greenhouse with dimensions of 2.64 x 2.16m then this should certainly be given serious consideration, particularly thanks to its unique appearance that could become a garden enhancing feature. This is the second glass greenhouse within our list to feature a wooden frame as well as horticultural glazing. Once again, however, we have considered it suitable for this table thanks to the glazing being the most instantly noticeable feature. The use of wood, however, does give it many advantages over its competitors, especially as we were pleased to see that the timber had been pressure treated. This means that a 15 year warranty is provided by the manufacturer, which should prove very reassuring to people who have made a significant outlay when purchasing this greenhouse. Indeed, it’s only the asking price which keeps this very well made glass greenhouse towards the foot of our league table. 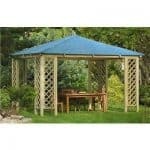 A hexagonal design is formed around a base size of 2.28 x 2.28m, and the cost for this is £2249.99. 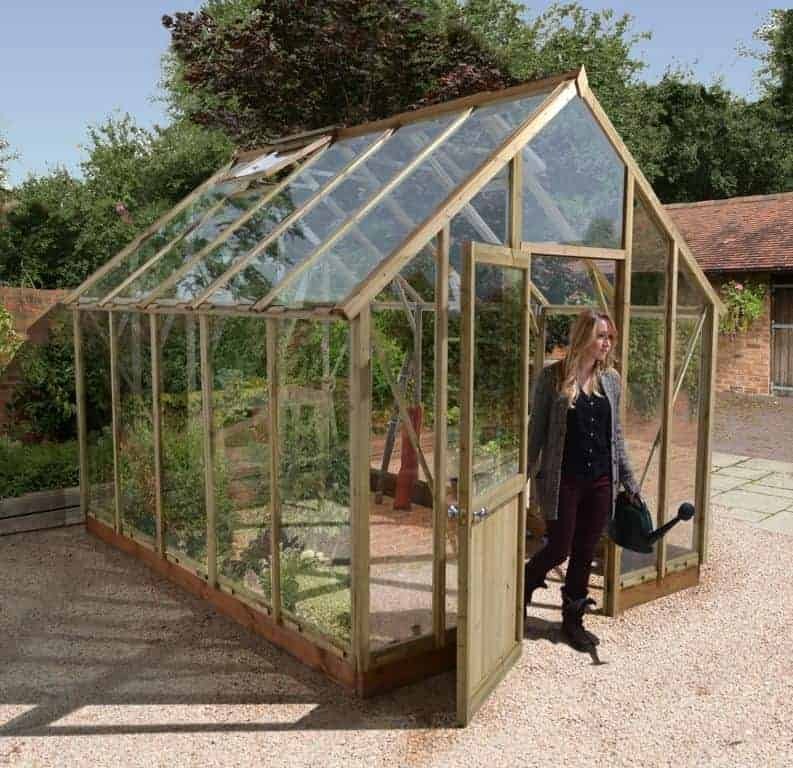 This makes it easily the most expensive greenhouse on our list, but on the positive side it is very attractive, and features toughened safety glass, brass ironmongery, a key operated lock and three opening windows. 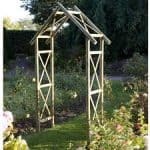 If you have a budget that encapsulates this price, therefore, we feel that this would make a more than useful addition to any garden. This is one of the most eye catching small to mid sized greenhouses that we’ve seen, with the dark green colour scheme making the curved eaves of the apex roof stand out even more. We believe that a good glass greenhouse should not only be a building that allows your favourite plants to thrive all year round, but also one that adds to the overall aesthetic appeal of a garden. That’s a function certainly achieved here, which accounts in part for its position within our top 20 league table. The sliding door at the front of this glass greenhouse is only of the single rather than double varierty, but its opening width of 0.60m is still enough to walk through or even push a wheelbarrow through without any difficulty. There’s also an integrated roof vent, making it easy for the owner to regulate the temperature. 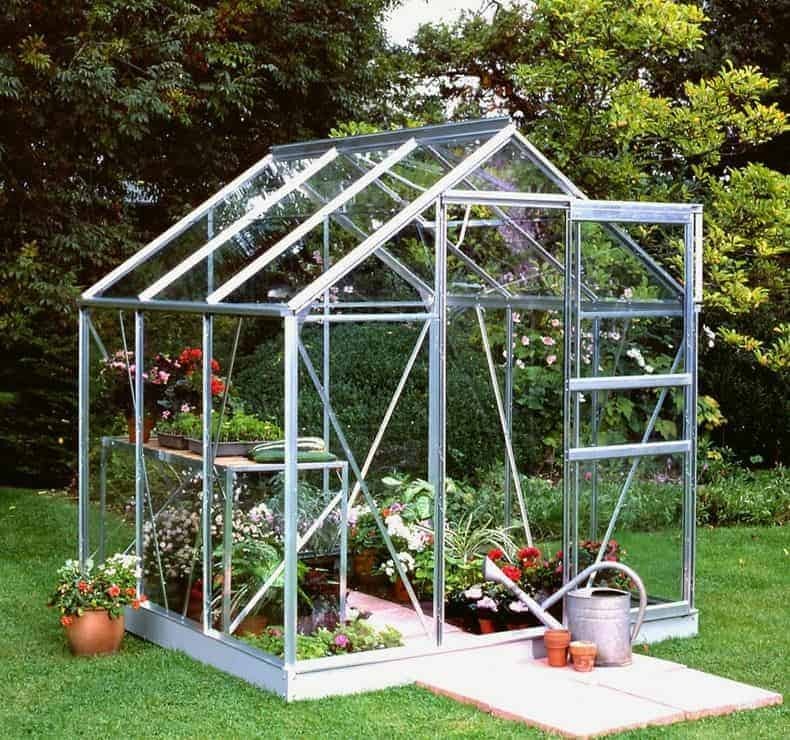 If you’re looking for a greenhouse that is very attractive, and that won’t take up too much valuable space in your garden, then this is certainly worthy of consideration. 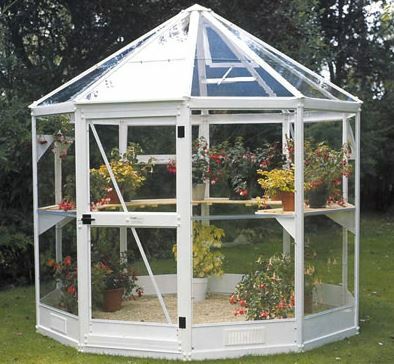 Even though it comes with only a basic one year warranty, in common with the other greenhouses in the Halls range, we feel that the high quality components used should make it much more durable than this suggests. We are always pleased to see a glass greenhouse that has a bold and dramatic design, and that stands out from its competitors for all the right reasons, as is the case with this 8 x 8 greenhouse from Fawt. It has ten sides, which makes it a very eye catching garden building, and yet once inside there is still lots of room to grow plants. The peak height, at the top of the cone shaped roof, is nearly eight feet as well, at 2.41m, so it feels a comfortable and spacious environment to carry out gardening in. We were pleased to see that a folded aluminium frame had been used, as this gives the structure extra strength. Indeed, it has been tested to withstand strong winds which makes it a great choice for gardens that are in areas exposed to the elements. We were also impressed with the amount of ventilation available in what is a mid sized glass greenhouse, thanks to the inclusion of one roof window, two side windows, and two vents integrated into the base. With toughened glass supplied as standard as well, this is a greenhouse with a lot to recommend it, although it also comes with a heightened price tag which accounts for its relatively lowly position within our top 20 league table. Once again with Fawt, we have a glass greenhouse that has a look that’s both unique and highly attractive. On this occasion we have an eight sided design, that incorporates ten glazed panels. As all of the glazing is made from toughened safety glass, there’s no need to worry about the glass shattering upon impact, and this can also make it a more secure environment in which to keep your much loved plants. 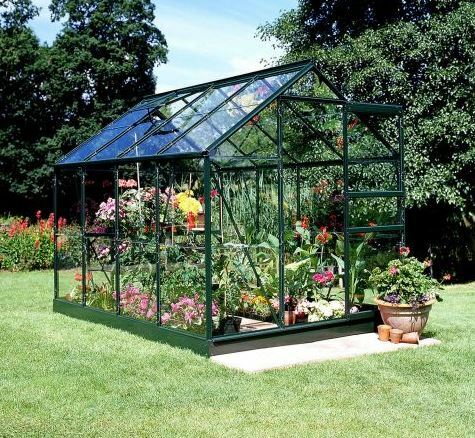 The price of nearly fourteen hundred pounds is more than we usually find for a greenhouse of approximately six feet by nine feet, especially as there is no extended warranty as would have liked to see. It’s also a little more expensive than the larger ten sided model featured above, which accounts for its relative positioning. 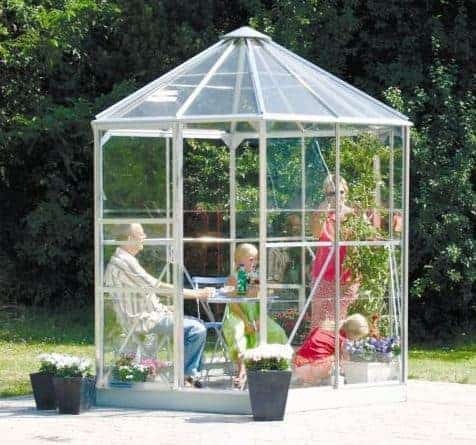 Nevertheless, this is a very high quality greenhouse, as demonstrated by the use of toughened glass and the inclusion of three windows and two vents. The two side windows have been placed diagonally opposite one another, to ensure that the interior receives maximum ventilation whichever direction the wind is blowing from. With ground anchors supplied as standard as well, this should be a tough, stable, and durable glass greenhouse, even if it does come with a price attached that may put it beyond the budget of some potential customers. When compiling this WhatShed guide to the 20 best glass greenhouses that can be bought online in the UK today, our first priority was to ensure that each glass greenhouse featured was of superb quality and offered great value to the customer. 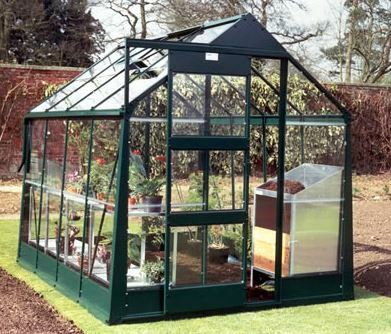 We also wanted to show the diverse styles of greenhouses available, as well as included greenhouses to suit all budgets. This final entry is very reasonably priced and unlike any other in our league table, in that it is a glazed wall garden rather than a conventional walk in greenhouse and yet it still has the quality, functionality, and added value that we always look for. It’s relatively shallow with a depth of just 0.71m, and yet its width of 1.93m and height of 2.07m mean that you can fit a lot of plants onto the integrated shelving. Accessing the interior is very easy thanks to the sliding single door, and it was just as easy to assemble the structure thanks to its simple clip in glazing system. That makes this wall garden with attractive curved eaves an excellent choice for people who want an all weather place in which to grow their plants, and yet don’t like the idea of having to construct a traditionally styled glass greenhouse themselves.